ROGERS, VIRGINIA MAY of Ortonville; died April 10, 2019. She was 74. Born on April 30, 1944 to the late Peter and Virginia Caroline (nee: Damoil) Christensen. 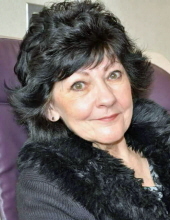 She is survived by two sons, Sherman Rogers and Sean (Tracie) Rogers; five grandchildren, Savannah Rogers, Kellsie Rogers, Alexis Rogers, Blayden Rogers and Milana Rogers; one sister, Joann Breakie; two brothers, Peter Christensen and Tim Christensen; also many nieces and nephews; she was preceded in death by one brother Tom Christensen. Virginia was a member of Bridgewood Church and was employed at Bueches. She was graduate of Rochester High School. Funeral service will be 11:00 a.m. Saturday, April 13, 2019 at VILLAGE FUNERAL HOME-ORTONVILLE 135 South St., Ortonville. Interment will follow at Ortonville Cemetery. Family will receive friends on Friday from 4:00 to 9:00 p.m. Memorial contributions may be made to Bridgewood Church. Envelopes are available at the funeral home. To send flowers or a remembrance gift to the family of VIRGINIA MAY ROGERS, please visit our Tribute Store. "Email Address" would like to share the life celebration of VIRGINIA MAY ROGERS. Click on the "link" to go to share a favorite memory or leave a condolence message for the family.